We have a blue lobster in our fish tank. The lobster just shed his shell. Is there a way to preserve the shell or at least the claws for our child to keep? Thank you. I accidentally came across your blog while searching for material on crayfish. I really hope you can take the time to answer my mail, as I am really interested in raring prawn/ crustaceans (particularly crayfish) in Malaysia. This would be a really novice question, would the American Crayfish be reared in a tropical climate ? Kuala Lumpur has a hot, tropical climate with heavy rain storms occurring throughout the year, mostly in the early evenings. Day time temperatures can reach around 95°F (35°C). What would be the best import species to be reared here ? I have a piece of land, roughly 20 acres with a running stream in it, I am now really thinking hard to rear something in it. What would your advise be if i wanted something crustaceans ? Milk: It Does a Body Shell Good? 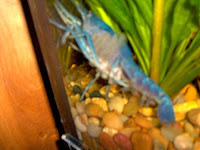 I'm afraid my electric blue lobster ins't getting enough calcium, what should I feed him? Can you tell me if any species of tadpole/longtail shrimp live in Taiwan? Thanks! I have a 3 year old Blue Lobster named Ozzy and he just molted and now he has these weird feather-like parasites growing off the side of him. They are an inch long. They were under his shell before he molted. They look like sea-corral and have feathered fans that look like they catch microorganisms. I was wondering if an anti-bacteria / anti-fungal medication will work eventually. It has done nothing so far. Do you know how to get rid of them without hurting Ozzy?